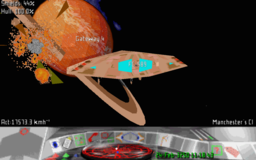 Four years ago, whilst looking for something unrelated, I stumbled across Tom Morton's port of "Frontier: Elite II" for the Atari to i386/OpenGL. This took me right back to playing Frontier on my Amiga in the mid-nineties. I spent a bit of time replaying Frontier and its sequel, First Encounters, for which there exists an interesting family of community-written game engines based on a reverse-engineering of the original DOS release. I made some scrappy notes about engines, patches etc. at the time, which are on my frontier page. With the recent release of Elite: Dangerous, I thought I'd pick up where I left in 2010 and see if I could get the Thargoid ship. I'm nowhere near yet, but I've spent some time trying to maximize income during the game's initial Soholian Fever period. My record in a JJFFE-derived engine (and winning the Wiccan Ware race during the same period) is currently £727,800. Can you do better?